Members of the project and stakehlders during the meeting. Picture: J.Latron. On Tuesday 27 January, the first stakeholder meeting of the LIFE Trivers project took place at the headquarters of the Júcar Water Agency, in Valencia. The meeting gathered stakeholders and experts involved in temporary river management who analysed the difficulties in assessing the ecological status of temporary rivers. 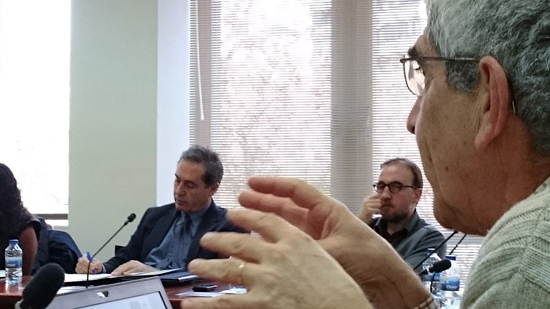 The researcher from IDAEA-CSIC, Francesc Gallart, explaining the functioning of the TREHS tool. Picture: N.Cid. 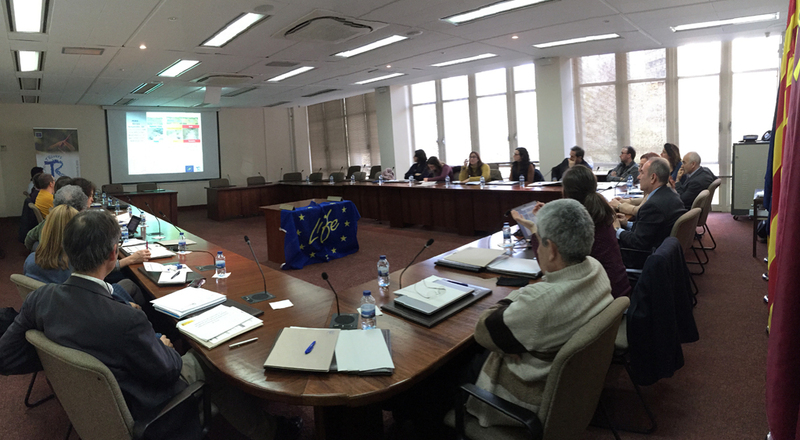 The meeting was opened by the president of the CHJ, María Ángeles Ureña, who highlighted the need to know better temporary rivers in order to improve their management. 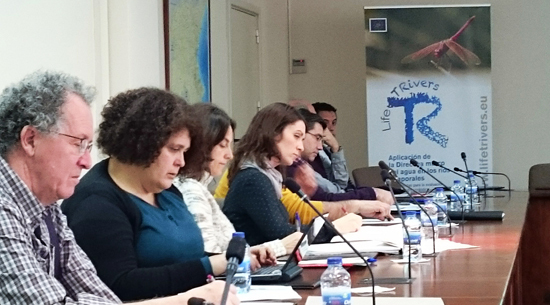 The session focused on the presentation of the first version of the software TREHS(Temporary Rivers Ecological and Hydrological Status), developed within the LIFE Trivers project. The software will enable to know the evolution of river hydrological characteristics over time and to determine the probability of water abstraction at different moments throughout the year; The tool is expected to help managers select appropriate sampling dates and use the right methods to determine ecological status. The programme uses observed data, predictive models and, as an alternative, surveys conducted among local population. Moreover, it contributes to determine if water abstraction is due to natural changes or human intervention. 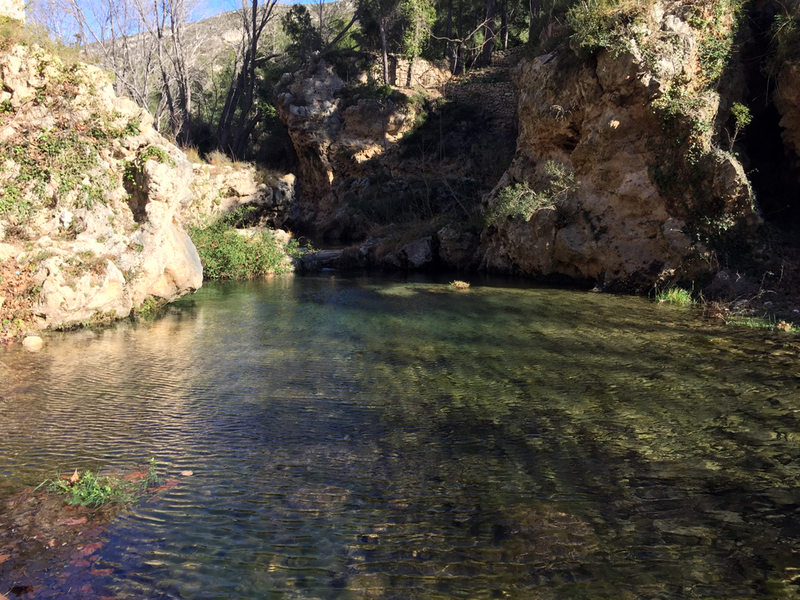 According to Francesc Gallart, researcher at IDAEA-CSIC, “to obtain the statistics of the different aquatic of a temporary river is the key to achieve Trivers’ objectives”. 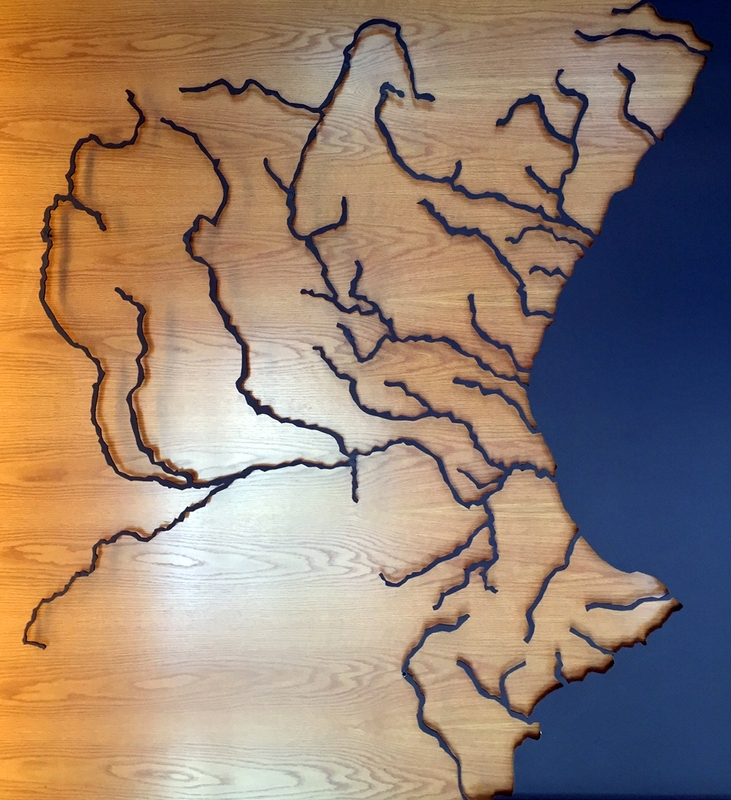 The Sénia River, a temporary river that defines the border between Catalonia and Valencian Region. Picture: J.Latron. Another fundamental aspect of Trivers project consists in determining the relationship among the hydrological conditions of a river and the biological communities that inhabit it. Habitat connectivity is the main factor that determines the aquatic fauna of a temporary river. Núria Cid, postdoctoral researcher in the Department of Ecology at the UB and Trivers project manager, affirms that “a river that is temporal in a natural way must be considered a different type of ecosystem, not a permanent river affected by human impact”. Teodoro Estrela, from the Júcar Water Agency, showing what is the present situation in temporary river management in this region. Picture: N.Cid. Tools designed to evaluate the ecological status are particularly addressed to permanent rivers and, in most cases, they cannot be used for temporary rives. 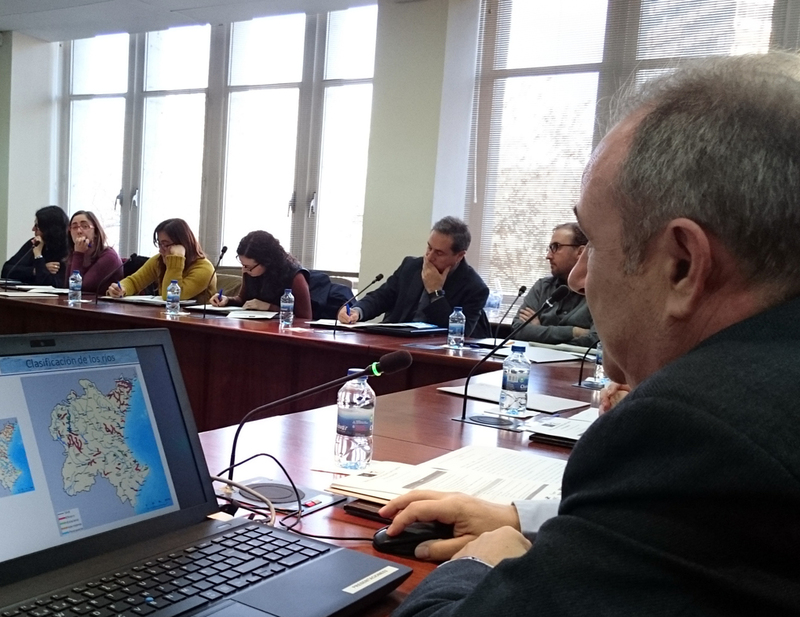 Antoni Munné, head of the Department of Aquatic Ecosystem Control and Improvement of the Catalan Water Agency, emphasizes that “reference data used to determine if a river is in a good ecological status vary depending on the moment in which samples are collected. To collect samples at a moment in which the river is dried up or, on the contrary, in a moment in which water flows is a crucial for diagnosis”. Within temporary rivers, managers are particularly worried about the ephemeral ones. Teodoro Estrela, head of the Hydrological Planning Office at the Júcar Water Agency, underlines that “it is necessary to establish some environmental objectives for temporary rivers, particularly for those in which water flows only some days in a year and the diagnosis of the ecological status is extremely difficult”. Participants interested in temporary river management. Picture: N.Cid. Participants’ opinions about the first version of TREHS were very positive; they highlighted software’s great ability to integrate information. Participants, for instance the Portuguese Environment Agency, showed interest in being part of a TREHS user community that will enable to exchange opinions, experiences and information and to apply the tool to temporary rivers in other basins. Mural at the headquarters of the Júcar Water Agency representing the river network. Picture: J.Latron.